Another TCAF has come and gone. I've gone to every single one and I think this is the 7th one I've exhibited at. 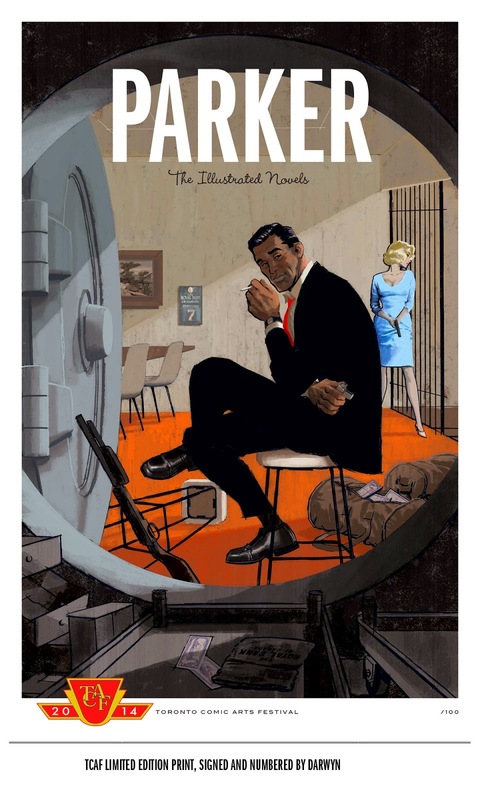 I've loved it since the very first one in 2003 when it was in the basement of a church - my table mate was Anders Nilsen, some O'Malley kid was scribbling in the corner and I got Michel Rabagliati to sign and sketch in a Paul book to me. 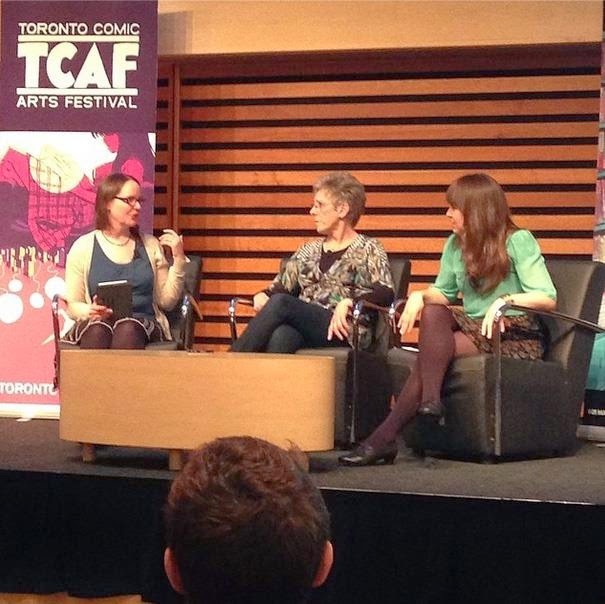 TCAF has always been my favourite comics show (and my most successful one), and this year was no exception. I brought 35 copies of my Gerald Bull book and came home with two. I sold 15 mini-comics, with the most popular one being my Banting comic (which I just did up another print run of) - that book just sells and sells. So all in all, about 50 books sold. 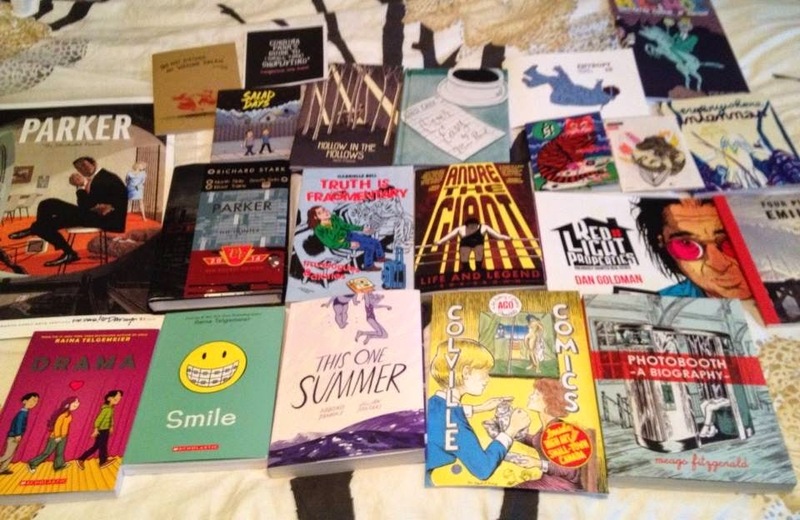 Not my best year (that was in 2007 when I sold over 100 books/comics), but not bad TCAF, not bad. My pal and fellow cartoonist Scott Chantler and I scarfed down some Mama's pizza, then ran over to the Opening Night Kick Off Event at the Reference Library which was terrific! Raina Telgemeirer moderated a panel with Lynn Johnston and Kate Beaton and it was a totally packed house. All three were delightful, but I have to say there is a special place in my heart for Lynn - what a talent! Of note was that Lynn Johnston said her favourite ever "For Better of For Worse" story was the one about Lawrence coming out. Still a classic. I found myself nodding in agreement when Kate Beaton explained that as a young girl seeing Lynn's comics in the paper everyday had a big impact. It was the exact same thing for me - Lynn Johnston was successful, talented and the only female cartoonist I had exposure to or knew of for quite a number of years. Seeing someone do the thing you want to do, and realizing it is possible is a big deal for a kid. The other thing that really resonated with me was when Kate Beaton said that she identifies with the artist kid in the class who is particularly happy to meet her (and who the other kids in the class identify as "the artist"). She was that artist kid when she was growing up too. It struck me that TCAF is made up of hundreds of these kids, all grown up. No wonder there is such a feeling of camaraderie, joy and wonder to the weekend! We all share similar life experiences and passions. We were all that kid. Afterwards was the show set up. While waiting for the "Learning Room" area to be ready (since all books that were shipped ahead of time were stored in this room), I sat and chatted with cartoonist Dan Goldman. I follow Dan online but we'd never met before. One of the great things about TCAF is meeting cartoonists "in real life" whose work you admire. He has a brand new book out "Red Light Properties" and I heartily recommend it. He's also a real nice guy. Leaving the hotel I was mistaken for Jillian Tamaki in the elevator (I take this as a huge compliment, but other than the fact that we're both female cartoonists with dark hair, we don't look much alike). I spotted Lynn Johnston having breakfast in the hotel restaurant and passed Jeff Smith coming in from a walk. Sooo many cartoonists just swarming downtown Toronto - I love it! In the morning before it got busy, I sat and chatted all too briefly with Marsha Cooke, one of my fave comics people in the world! A good hour later - her other half, Darwyn finally sat down at his table to a long line-up of fans. He had so many cool, exclusive items available just for TCAF. I had to pick up one of these sweet Parker prints (at right). My hubby Dave made it to the show at around 4:45 PM, so he had about 15 minutes to look around before we headed out to dinner with the D&Q gang. I got to sit beside Mimi Pond, which was a thrill. She's as funny and charming as you might expect. Then we all hoofed it over to the Marriott for the Doug Wright Awards. The Doug Wrights were super smooth (no fire alarm this year), and Scott Thompson was a hoot. Don McKellar jumped in at one point to help Scott out with pronunciation of nominee names - it was very funny. Scott should always host the show, then have other previous hosts jump in like this. I had finished colouring my "Nipper" Kickstarter piece the night before in my hotel room. Cutting it a little close? Yes. I'm happy with how it came out though, and it did get shown on the screen with all the other cartoonist submissions. Chester Brown's one is of course, the best one. Then we hit up the Pilot for Chip Zdarsky's party. Since we're old, we stayed for a few drinks then went back to the hotel to crash. We did get to congratulate Chip on being a New York Times' best-selling artist though. He was hilarious as usual. In the morning Dave and I went for breakfast with good friend Frank Cammuso and his family. This was one of our favourite parts of the whole trip - it was great catching up. We love you Frank, Ngoc and Kai! I've always been fortunate enough to be in the "main drag" section on the first floor of the Reference Library. This year, being in the "Learning Centre", I was in a small room off to the side of the winding staircase on the first floor. Though there was obviously a lot of care taken in choosing creators for this room, (I had awesome neighbours like Matt from Hic and Hoc & Yeti Press), but we definitely didn't get as much traffic as the main areas. Saturday was crazy BUSY on the main floor, but my Sunday was actually busier than Saturday this year, maybe because people were "finding" us after making the full rounds. I say this because even up to the last hour on Sunday, people were coming into the room saying they didn't know our room was part of the show. In the afternoon I did a panel on non-fiction comics and that went really well. A stellar group of cartoonists were on the panel and moderator Brigid Alverson did a terrific job. We could have easily talked for another hour! The best part? A guy came up afterwards and said he'd like to get a copy of my book. I happened to have one on me, so was ready to sell it to him. Then he introduced himself as Ken Steacy! Of course, I just had to sign it and give it to him - he's like Canadian comics royalty! What a nice guy. All in all, it was a great show, and lots of good friends dropped by like David Collier, Jaime Colville, Tom Spurgeon, Emily Pohl-Weary and Steve Manale. Caught up with lots of others like Willow Dawson, Claudia Davile, Michael Cho, J. Torres, Ed Kanerva, Natalie Atkinson, Aaron Costain, John Martz, Matt Forsythe, Annie Koyama, Scott and many more! Finally I picked up LOTS of amazing comics! Kudos to the Beguiling, Chris Butcher and the TCAF team. Another banner year. My TCAF haul. So many good comics!